Judy Garland: The London Studio Recordings 1957-1964. First Hand Records FHR12. (2 CDs). Judy Garland (1922-1969) adored London. It was there that audiences welcomed her in 1951 after she left Metro-Goldwyn-Mayer in 1950, and there that she died. The four and only times she ever did studio recordings in London – 1957, 1960, 1962, and 1964 – were during her Capitol Records tenure from 1955 to1965. In London in 1957 to appear at the Dominion Theatre, Garland recorded “It’s Lovely to Be Back in London” as a give-away single for those attending opening night. After a bout of hepatitis in late 1959, Garland did a side for the Colpix film Pepe called “The Far Away Part of Town,” recorded the LP That’s Entertainment for Capitol, then flew to London where between August 2 and 9 she recorded twenty tracks for Capitol that were intended as a musical biography. Garland returned to London in mid-1962 to do what turned out to be her last film, I Could Go On Singing, for which she recorded several tracks. Finally, her 1964 recordings, her last studio session for the label, consist of four tunes from the Lionel Bart West End musical Maggie May. All done at Abbey Road, these EMI/Capitol recordings are regrouped in First Hand Records’ new 2-CD set. These are not, however, all of Garland’s London sides. As the title states, all the First Hand tracks are studio dates, thus excluding one track Garland performed live on-camera in I Could Go On Singing, as well as her redubs for the now-infamous Palladium shows from 1964 with daughter Liza Minnelli. Also excluded are several alternates that have been released over the past decade. One alternate was even vetoed by the Garland Estate. That Judy Garland: The London Studio Recordings 1957-1964 is incomplete does not detract from the fact that it is a splendid and noble accomplishment. The new First Hand set is divided into five sections: the first four correspond to the four times Garland recorded in London, and the fifth section, called “Garland at work in the studio,” includes fourteen previously unissued tracks from 1960, 1962 and 1964. It is these previously unissued tracks that make the First Hand set an event. “It’s Lovely to Be Back in London,” whose words and music were written by Garland’s MGM mentor Roger Edens, was her first London studio side, recorded at Abbey Road on October 11, 1957, just days before her October 16, 1957 opening at the Dominion Theatre. Given away free to opening nighters and first officially released on CD in EMI’s 1999 Judy Garland – Legends of the 20th Century, the single has here been expertly remastered by First Hand and surpasses all previous releases. No alternates were found. The year 1960 could be called Judy Garland’s most productive year in terms of the number of recordings she did; it could also be could called more or less the end of her recording career, at least insofar as studio dates. Between her Colpix and Capitol sessions in Los Angeles and her EMI ones in London, she laid down a phenomenal thirty-three sides in all that year – something she had never done in her already long career. Robust, at a healthy albeit sturdy weight, and keeping her prescription drug dependency down to a minimum, in 1960 Judy Garland was on fire and her voice a pistol. The London Sessions, as they have come to be called, reflect that vibrant health. A musical memory lane, these sessions also look ahead, for she sang six tunes – “Chicago,” “Stormy Weather,” “I Happen to Like New York,” “Why Was I Born?,” “San Francisco,” “You Go To My Head” – she had never previously recorded in the studio. The London Sessions, however, were never released at the time because she had just a few weeks earlier recorded the Capitol LP That’s Entertainment!. A few months after recording the London Sessions, Garland began her 1961 tour, including the April 23, 1961 date at Carnegie Hall, which was recorded by Capitol and released on July 10, 1961. To have released the London Sessions, which contained much the same material as Carnegie Hall, at the same time as Carnegie Hall would have been redundant. The first time any of these sessions appeared on disc was the 1962 The Garland Touch, which contained six tracks culled from the August 1960 dates. The next time these tracks surfaced, this time integrally, was on a 1972 double-LP, some three years after her 1969 death. Capitol released the London Sessions integrally on compact disc for the first time in 1991 as part of their three-CD box set, Judy Garland – The One and Only, and re-released them in 1992 as a single disc. As heard on the First Hand set, the orchestra and chorus, as conducted by Norrie Paramor, although not always as swinging as an American group of musicians, have never sounded as lush. It is interesting that the brochure, by revising previously published recording dates for some of the tracks, raises more questions about the said dates than it answers. In an appendix to the liner notes, producer Jonathan Summers states that “In recent years CD re-issues of Garland’s Capitol recordings have included incorrect recording information and with this issue we have made every effort to provide correct recording dates. Where we have had the original tapes, these have been the source for the discographical information, but in other instances we have had to rely on a document prepared by Capitol in 1977, some dates from which do not correspond with those on the extant tape boxes.” A reasoned conclusion one can draw from the conflicting dates is that Garland recorded the London Sessions on August 2, 3, 4, 5, and 8, and did retakes of certain songs on August 8 and 9. Garland was tired and wired for her 1962 sessions for the movie I Could Go On Singing, filmed in England. After her thirty-one stop 1961 tour, an early 1962 television special, a non-singing role in the John Cassavettes film A Child is Waiting, and a live album that was to be a follow-up to Carnegie Hall, by mid-1962 Garland was worn-out and overmedicated, and this was reflected in her voice and acting. She recorded five tunes for the film (which would turn out to be her last), including two new ones: “Please Say ‘Ah’!,” a demo not used in the movie, and the title track, written by Harold Arlen and E.Y. Harburg, the same team that wrote “Over the Rainbow” a quarter century earlier. Far from her best film, I Could Go On Singing is far from her worst. She even helped write the emergency room scene towards the end of the movie, and it is one of the best things she ever did on screen. The voice is ragged, the acting intense, and this is what gives the picture its edge. So attuned was Garland by this point to singing before an audience, two pre-recordings, “Hello Bluebird” and “By Myself”, to be filmed at The Palladium before a full hall, were recorded at Abbey Road with a small audience present in the studio to applaud, which can be heard on the First Hand set. The studio applause was later mixed in with the applause recorded when the numbers were filmed before a live audience. Garland recorded the extraordinary Kurt Weill/Maxwell Anderson tune “It Never Was You” at Abbey Road (there are in fact two extant takes of her studio performances), but in the end director Ronald Neame decided to build a replica of the Palladium stage and allow her to sing the song live before the camera. Since the First Hand set consists uniquely of studio performances, this live camera performance is not included. Instead, we are offered one of the studio alternates of “It Never Was You,” even though that take is not heard in the film. Finally, the title tune, “I Could Go On Singing,” which for many years was available on LP and CD based on the optical track, can here be heard in all it glory based on the master studio take. On all these tracks, conductor Mort Lindsey’s hard-hitting great-sounding orchestra gives added bite to all the arrangements, signed by Mort Lindsey. By 1964, date of her last sessions at EMI, Garland’s voice had so deteriorated that she sounded more like Shirley Bassey than Judy Garland. “The Land of Promises,” and “It’s Yourself,” recorded on August 6, and “Maggie, Maggie May,” and “There’s Only One Union,” recorded on August 12, all written by Lionel Bart for his West End show Maggie May, are not great songs, and none of them went anywhere on the charts. Just back from a headline-making tour of Australia, Garland had taken an accidental overdose in Hong Kong during a typhoon and had to have her stomach pumped, which permanently damaged her vocal chords. These sides are a pathetic end to her Capitol years. “Garland at work in the studio,” the final part of the set, contains fourteen previously unissued tracks from 1960, 1962, and 1964. Included are alternates, introductions, and partial takes, all of which have a historic interest. The most surprising find is “Please Say ‘Ah’!,” an outtake from I Could Go On Singing, recorded on July 9, 1962. Never heard in forty-nine years, this novelty number, written by Mort Lindsey and MGM cohort Saul Chaplin, who duets with Garland on the track, was no doubt intended as a demo for film costar Dirk Bogarde, who in the film plays a throat doctor and Garland’s ex-husband. The comic ditty, very reminiscent of the Sophia Loren-Peter Sellers duet “Good Gracious Me” from the 1960 romantic comedy film The Millionairess, makes absolutely no sense in the rather somber context of I Could Go On Singing, which deals with divorce, disappointment, and a lot of hard knocks. The song seems to have been dropped as soon as it was concocted, and remained in the Abbey Road vaults until 2011. However interesting a discovery, it is a rather minor opus in the Garland discography. 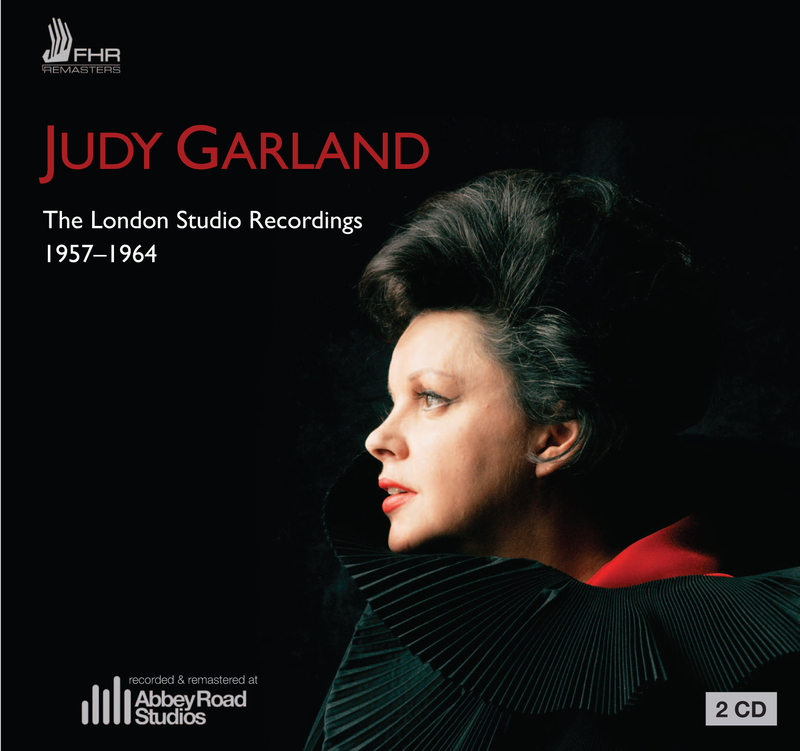 In releasing Judy Garland: The London Studio Recordings 1957-1964, First Hand Records has had the courage to replace EMI/Capitol, which wouldn’t finance the project. In a depressed music market where such lavish reissues are a dwindling breed, First Hand has singlehandedly gone to the expense of allowing Abbey Road Studios audio engineers Ian Jones and Peter Mew to masterfully remaster these half-century old tapes, which here are given a second life. Musical archeologists, First Hand has unearthed musical treasures that were waiting to be unearthed, and for that they deserve the highest praise. Besides all the tracks new to CD, the previously issued London Sessions from 1960 have here been restored to a point that far surpasses previous releases. The classy digipak, along with the well-written, informative 31-page liner notes by Jonathan Summers, are added reasons for calling this set one of the most important Judy Garland releases ever. Reviewed by Lawrence Schulman. The information written on the session boxes, which we had full access to, are very clear including as to which songs were recorded on which days. On the session tape box for the medley “You made me love you”, for example, the recording date is clearly written as 9 Aug. 1960 (as you know, the matrix states this as rec. 8 Aug. [sic]). The info written on this particular session box also specifies take numbers, false starts, breakdowns and also which takes/sections were to be edited and used for the master – we have listened to all the tapes and they correspond to this written information. Also, this medley was recorded on just one day i.e. 9 Aug. 1960 thus on this day Garland must have been present – it wasn’t just a day when a recording was finished off without the need of Garland’s presence. There is no evidence, apart from the matrix date, that states this medley was recorded on another day. This is just one example. All the other sessions boxes contain similar, clearly written information as above (you can see examples in the two box scans in the issue booklet). The Capitol Archive contains no ledgers for these London session recordings (well at least they couldn’t locate anything). We recently spoke to Malcolm Addey, the main London Sessions recording engineer, and he told us if his name is on the box, then he will have written all the info on the box/tape and it will be very accurate. We know the Abbey Road engineers from this era had a reputation for being fastidious when writing information on the tape boxes. The errors in these dates therefore must have happened at the next stage of production i.e. when the final edited production masters were cut from these session tapes. This will have been done at L.A. Capitol studios where the master numbers (matrix numbers) were applied. Ian Jones, the remastering engineer, also states that the dates given on the boxes are definitive and he has no doubt that the dates in the First Hand issue are correct. Please also note that the 1972 UK issue of the London Sessions has “Recorded 2-9, 1960” written on the sleeve. Garland stated on the June 24, 1968 The Tonight Show that her run at The London Palladium between April 9, 1951 and May 5, 1951 was one of the most memorable moments of her life. Live recordings have been released of Garland in London at the Palladium in 1951 and the Dominion in 1957, both issued on Lost Tracks, 2010, JSP Records 965; at the Palladium in 1964, issued on Judy Garland and Liza Minnelli “Live” at the London Palladium, 2010, DRG Records DRG-CD-19126; as well as at The Talk of the Town in 1969, issued on the LP Judy. London. 1969., 1969, Juno S-1000. Her performance at the Free Trade Hall in Manchester, England on December 4, 1960 is said to exist. A Souvenir from Miss Showbusiness “The Judy Garland Show,” 45 rpm, Capitol/EMI Records, F 17691 SP, recorded October 11, 1957, released October 16, 1957. The B side contained “By Myself,” recorded February 22, 1957, from the Alone LP (Capitol Records, T-835), released May 6, 1957. Garland entered Doctor’s Hospital in New York on November 18, 1959 and was released on January 5, 1960. A division of Columbia Pictures Corp.. Recorded in April 1960. Words by Dory Langdon, Music by Andre Previn. Nominated for Best Song at the Academy Awards. Collector’s Choice Music, CCM-113-2, 1999. Recorded on June 8, 9, and 17, 1960. Collectables Records COL CD 2839, 2002. See paragraph below on the London Sessions and Afterword. “Hello Bluebird” (recorded May 9, 1962), “By Myself” (recorded May 9, 1962), “It Never Was You” (recorded May 9, 1962), “I Could Go On Singing” (recorded July 9, 1962), and “Please Say ‘Ah’!” (recorded July 9, 1962). First released integrally on CD on Classic Judy Garland – The Capitol Years 1955-1965, Capitol CDP 7243 5 39282 2 3, 2002. “It Never Was You” (Words by Maxwell Anderson, Music by Kurt Weill). Garland and Minnelli performed together live at the London Palladium on November 8 and November 15, 1964. Both of these evenings were recorded by EMI, and ITV taped the second show. Both singers overdubbed several songs at Abbey Road on November 23 in order to improve certain vocal inadequacies. For a full history of the Palladium recording, see Schulman, Lawrence. “The Plagued History of Judy Garland and Liza Minnelli “Live” at the London Palladium, 1965-2009.” ARSC Journal, 2009; 40(2): 174-188, published online at http://www.thejudyroom.com/discography/capitol/palladiumarticle.pdf. Classic Judy Garland – The Capitol Years: 1955-1965 (Capitol CDP 7243 5 39282 2 3), released in 2002, contains an alternate version of “There’s Only One Union” that is different from the one heard on the original 1964 EP. The Essential Judy Garland (Capitol/EMI 09463-59451-2-6), released in 2006, contains three studio alternates not found on the First Hand set: “Why Was I Born?” (1960) (unknown take number), “Happiness Is a Thing Called Joe,” (1960) (unknown take number) which is not listed as an alternate, but is; and “It Never Was You” (1962) (take 4). The Very Best of Judy Garland (EMI 0946-3-79249-2-0), released in 2007, contains two studio alternates not found in the First Hand set: “Stormy Weather” (take 1) and “Over the Rainbow” (take 1). According to the producer’s notes, the final release versions of both songs were composites of two takes. Roger Edens (1905-1970) helped polish Garland’s singing in her early years at MGM. He was also the composer of such Garland records as “In Between,” “Sweet Sixteen,” “Figaro,” “Our Love Affair,” “It’s a Great Day for the Irish,” as well as the recitatives for “(Dear Mr. Gable) You Made Me Love You” and “I Cried for You.” It is he who wrote the comic bridge for “When You’re Smiling” and the introduction to “San Francisco” performed by Garland in 1961 at Carnegie Hall, and elsewhere. The liner notes in Judy Garland – Legends of the 20th Century give the recording date as October 11, 1957, as does the track list in the First Hand set. However, in Schechter, Scott. Judy Garland: The Day-By-Day Chronicle of a Legend. New York: Cooper Square Press, 2002, p. 211, it is listed as October 12, 1957. The orchestra for this session was under the direction of Geoff Love. EMI Records, Ltd. (U.K.) 7243 522228 2 7. The reverb so prominent on the single is in fact on the master tape, and cannot be removed. Two live albums, Judy at Carnegie Hall (1961) and Judy Garland and Liza Minnelli “Live” at the London Palladium (1965), as well as two studio tracks, “Comes Once in a Lifetime” and “Sweet Danger” she recorded for Capitol in New York in the fall of 1961, were still ahead of her. Garland sang this song as a youngster. See Frank, Gerold. Judy. New York: Harper & Row, 1975, p. 57. Garland recorded “You’ll Never Walk Alone,” a song she had never previously recorded for Capitol, during the London Sessions, although she had previously recorded it for Decca Records on July 10, 1945. Capitol Records T-1467, recorded on June 8, 9, and 17, 1960, released on October 31, 1960. DRG EMI Music Special Markets DRG-CD-94785. At the time of the original release of The Garland Touch in 1962, nowhere on the back cover of the LP was it indicated the exact provenance of the six tracks in question. Purchasers were thus left in the dark as to exactly when and where these tracks had been recorded. Capitol Records Club SBQE 94407. Capitol Records D 217007, CD 3: The London Sessions. The Best of the Capitol Masters – The London Sessions. Capitol Records CDP 7 99618 2. August 2, 1960: “Chicago” (master # 34437), “Do It Again” (34438), Lucky Day” (34437 – the same as “Chicago,” according to the Judy Garland – The One & Only) (or 34439? ), “Stormy Weather” (34440). August 3, 1960: “I Happen To Like New York” (34441), “Swanee” (34442), “You’ll Never Walk Alone” (34443), “Why Was I Born?” (34444). August 4, 1960: “The Man That Got Away” (34445), “Come Rain or Come Shine” (34446), “San Francisco” (34447), “Over the Rainbow” (34448). August 5, 1960: “Medley: You Made Me Love You/For Me and My Gal/The Trolley Song” (34449), “You Go To My Head” (34450), “Happiness Is a Thing Called Joe” (34451), “Rock-A-Bye Your Baby (with a Dixie Melody) (34452). August 8, 1960: “Medley: Judy at the Palace” (34453), “I Can’t Give You Anything But Love” (34454), “After You’ve Gone” (34455), “It’s a Great Day for the Irish” (34456). First Hand, in their track list, states that “Happiness Is a Thing Called Joe” was recorded on August 8, 1960, and that “Stormy Weather,” “Medley: Judy at the Palace,” “It’s a Great Day for the Irish,” “Medley: You Made Me Love You/For Me and My Gal/The Trolley Song,” and “Over the Rainbow” were recorded on August 9, 1960. If First Hand’s recording dates are indeed exact, the songs would have been recorded out of master order. The Judy Garland Show (Special), CBS, taped January 5, 8, and 9, 1962 and aired on February 25, 1962, with Frank Sinatra and Dean Martin, 60 minutes. Recorded at Manhattan Center on April 26, 1962 but never issued at the time because of Garland’s laryngitis that evening, the concert was finally released in 1989 as Judy Garland – Live!, Capitol CDP 7 92343 2. Sid Luft (1915-2005), Garland’s husband from 1951 to 1965 and her on-and-off manager/producer, told the author in the early 1990s that he advised Garland, whom he thought was overworked, not to do the film. In the First Hand liner notes, the take number for this alternate is identified as take 6. In their track list, however, it is simply labeled “previously unissued alternate take.” The other studio alternate of the song heard in The Essential Judy Garland is take 4. Mort Lindsey (born 1923) conducted and orchestrated for Garland between 1961and 1965, including at Carnegie Hall in 1961 and for her television series in 1963-1964. Lionel Bart (1930-1999) scored a big success with the 1960 show Oliver, from which Garland sang “As Long As He Needs Me.” He was present at her August 12, 1964 recording session. The orchestra for these sessions was under the direction of Harry Robinson. Alan Livingston (1917-2009), former head of Capitol Records, stated in the A&E Biography Judy – Beyond the Rainbow, aired in 1997, that he discussed doing a new studio album for the label with her in the mid-1960s, but her monetary demands were greater than what the label could afford. Saul Chaplin (1912-1997), in the chapter on I Could Go on Singing in his memoir Chaplin, Saul, The Golden Age of Movie Musical and Me. Norman and London: University of Oklahoma Press, 1994, makes no mention of this song. Lawrence Schulman was the associate producer on Judy Garland: The Carnegie Hall Concert (JSP Records, 2012), compiled and annotated Judy Garland: Smilin’ Through: The Singles Collection 1936-1947 (JSP Records, 2011), Judy Garland: Lost Tracks 1929-1959 (JSP Records, 2010), Judy Garland: Classiques et inédits 1929-1956 (Frémeaux & Associés, 2008), Judy Garland: Child of Hollywood – Great Original Performances 1936-1942 (CDS Records/Nimbus, 1993 and 2000), and annotated Judy Garland à Paris: Olympia, 28 Octobre 1960 (RTE/Europe 1/Laserlight Digital, 1994 and 2005). A reviewer and feature writer for the ARSC Journal since 1994, he also translates for the French website OpusHD.net.